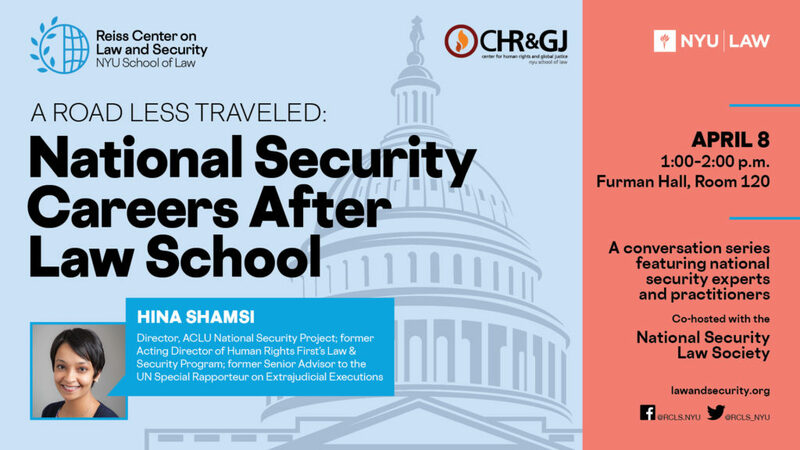 On Monday, April 8, the Reiss Center on Law and Security, the Center for Human Rights and Global Justice, and the National Security Law Society will host Hina Shamsi, Director of the ACLU National Security Project, for the fourth session of a series featuring national security law and policy practitioners. Prior to her work at the ACLU, Shamsi was the acting director of Human Rights First’s Law & Security Program and previously served as senior advisor to the UN Special Rapporteur on Extrajudicial Executions. She will speak with students about her career path after law school and her experience working in the public interest national security and human rights field. This event is only open to NYU Law students. Space is limited. To RSVP, please contact rcls.law@nyu.edu.